I was on site at 11 a.m. to hear Bob Archer and Shepherd's Rho open the day of dancing in the Roadhouse. Experienced English country dancers loved the elegant set that encompassed many styles of English dance: fancy (with a rigadoon), fast-paced, and flowing. Another highlight of the morning in the Roadhouse was a contra set with Thursday Night Special. The caller, Morna Leonard, told me later fiddler Alan Roberts had chosen the music, which was some of the freshest, most distinctively Western contradance music I've ever heard. It was like dancing to something scored by Aaron Copland. 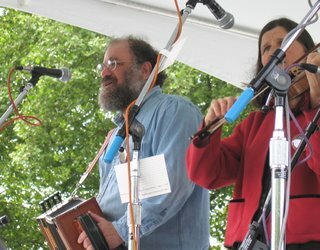 I caught the Louisiana incarnation of Bellingham's versatile Happy Valley Sluggers in the afternoon (the photo shows vocalist and accordion player Mike Schway and fiddler Laurel Bliss). Their set of traditional Cajun songs had people dancing on the grass. On the way home at 7, I heard Portland's March Fourth Marching Band's performance titled "Punk as Folk: Trad Strikes Bank." Sassying, swinging, and accompanied by stiltwalkers, this was clearly Fremont-Solstice-Parade-Meets-Folklife. M4 is headed for Germany for the World Cup and Battle of the Carnival Bands competition in June. Still haven't found any really exciting new food at Folklife -- but there are still two days of the festival yet to go. Any recommendations?